AIGA development director Patty Driskel (left) and chapter vice president Eva Gutierrez. After the devastation of three major fires in the past 10 months, Santa Barbara and its residents are still trying to recover. Some do this by rebuilding their homes or trying to get their lives back. Others sell t-shirts to help the fire victims. The Santa Barbara chapter of the American Institute for Graphic Arts took it upon themselves to start a charity fundraiser for the victims of all three fires that have happened in the past ten months. “We picked the Unity Shoppe because they’re there when the Red Cross and everyone are gone. They help with bedding and everything you need to start over,” said Patty Driskel, the director of development for AIGA in Santa Barbara. The AIGA fundraising booth at Gelson's. AIGA have created a design that’s being printed on white and red t-shirts as well as tote bags, which they are selling. After covering the costs of making the shirts and bags, all the proceeds will be donated to the Unity Shoppe. “The Unity Shoppe will set up an appointment with the fire victim as a client and provide linens, dishes, the things you need to recreate your life,” said Driskel. Rather than giving fire victims money, they provide them with products that they need to start over. 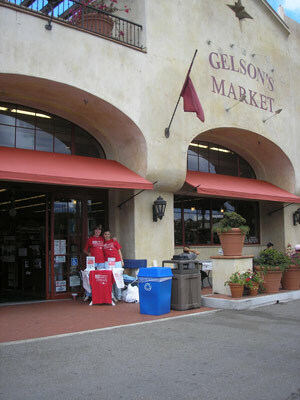 This past weekend while selling the shirts and bags at Gelson’s Market, passersby stopped to swap fire stories with Driskel and Eva Gutierrez, the vice president of the Santa Barbara AIGA. Even those who had not lost a home seemed to have been affected by the fires. “Everyone from Goleta to Santa Barbara has been affected by the fires. They either were an evacuee or house evacuees or inhaled the ash,” said Driskel, who was directly affected by the Gap Fire last summer. Driskel said that she remembered the firefighters yelling for her to “get out, get out now” as she and her daughter rushed around the house grabbing their belongings. “You don’t know what the insurance companies are going to do to you. You have to keep track of everything,” said Gutierrez. The Unity Shoppe fundraiser will help those who are in need or permanent or temporary household items that they may not get back after the fires. Each shirt and bag have a graphic designed by AIGA that thank the firefighters, list the dates of the three fires, and give the acre and structure destroyed count for each fire. Shirts range from $10 to $12 and tote bags are $5. They can be purchased at the AIGA stand, online at santabarbara.aiga.org, at Vices and Spices, or Sheer Artistry. Last week, the AIGA stand was at the Vons in Montecito, the Gelson’s off of Las Positas, and the Borders at the Camino Real Marketplace. 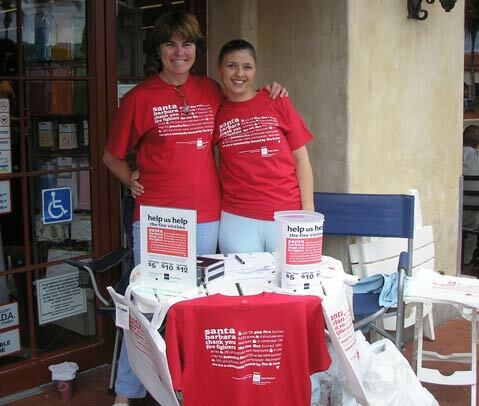 This Saturday, June 13, they will be at the Trader Joe’s in Goleta from 11 a.m. to 3 p.m.